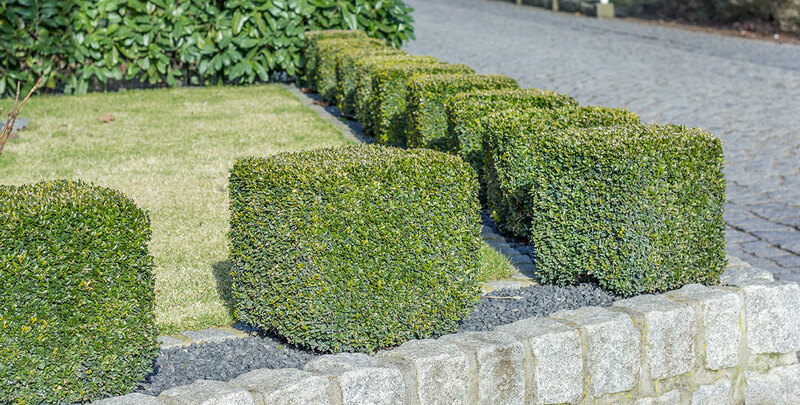 Box cubes are instant hedges for anyone who enjoys the classic shape of a low box hedge, but does not have the time or the topiary skills to cut the plants back to a neatly trimmed cube. Box or buxus sempervirens is the most popular plant for topiary purposes, as it is very slow-growing – it has an average annual growth rate of 10 to 15 centimetres – and responds exceptionally well to pruning. These instant box cubes allow you to plant a neatly trimmed box hedge in your garden within several hours. However, you can also choose to order a box cube in a pot and put it on your terrace or balcony, if you so desire. Box is an evergreen hedge plant and will therefore retain its shape even during the winter months. Since these box plants have been trimmed to shape by topiary experts at the nursery, these plants will already look spectacular when they are delivered to your doorstep. When it comes to finding the right location for your box cube, the only thing you need to remember is that box does not like wet or windy locations. Otherwise, box is remarkably undemanding. It will even thrive in poor soils, although it has a preference for a position in the semi-shade in a well-drained soil. A box cube only requires some light pruning in order to keep it neatly shaped.